Should we be preparing our students to change the world? All too often we focus on the skills needed for our girls to thrive in a world which is increasingly dominated by technology. Technology is changing the way we work, play and communicate. I recently attended an informative presentation given by Minister Naledi Pandor where the focus was again on prioritizing Science and Technology in education, specifically in girls’ schools. The statistics regarding women studying at tertiary institutions confirm the need to integrate STEAM into our curriculum while preparing our students for this changing world. Alongside this presentation, further information was presented by Roy Gluckman and Obenewa Amponsah, equality, inclusion and diversity facilitators, where they challenged parents and teachers to consider that together with this skills set, perhaps we should refocus our attention to developing leaders who can change the world through leading lives of significance. The top 10 skills published by the World Economic Forum, which Lisa Kaplan shared at the 2018 Speech evening recently, reiterate the importance of the skills which will most certainly lead to effective leadership and in turn hopefully a better world for future generations. In dialogue with parents, girls and teaching staff alike, let’s ensure that we teach our students skills which empower them to make sustainable, proactive, positive changes both locally and globally. Over the weekend, our Transformation, Diversity and Integration (TDI) and school executive committee met for a workshop hosted by Mandate Molefe, following the parent evening hosted on Monday 8 October, where the results of the survey were shared and discussed. The workshop involved deep personal reflection on unconscious bias, procedures and practices. We had hard conversations, unpacked many topics and considered the perspectives of each other from many different angles. Each of us left wondering how we could, in our own way, actively pursue a sense of belonging for each of our stakeholders, and with a firm commitment forward. The journey of transformation is continuing, strongly and purposefully, daily in our school. We have worked intensely on a commitment of strategic intent, which will, over the next few weeks, be shared with our community. To date, we have worked deliberately on particular areas of development from our survey, and this weekend has afforded us the ability to identify even more, through the support of our parents, teachers, students and executive. Please continue to contribute and get involved in this journey with us! You will find our updates in our weekly communications and on the App, and would love to see you at our upcoming workshops and functions. We need your voice to join ours. We also invite you to join our executive team in reading, “A School Where I Belong.” By Wray, Hellenberg and Jansen (https://www.aschoolwhereibelong.com) . Together, we seek to create a school of belonging, which can only be created together as a community. 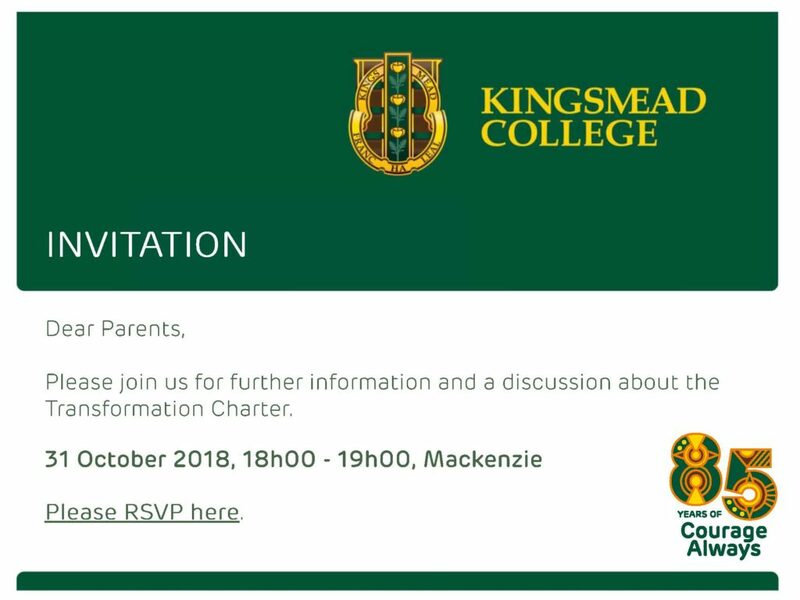 Kingsmead will be taking part in the Grade 1-3 APPS gala on Wednesday 14 November 2018. The coaches have been busy in Physical Education lessons taking times for the various strokes. The APPS team will be finalised after the Grade 1-3 fun gala to be held on the 31st October 2018. Once finalised the team will be published on the 2nd November 2018. The girls who are selected will be expected to attend 2 training sessions per week so we can prepare them for the gala. Swimming lists for the Grade 1-3 fun gala will be published after half term. On Friday 12th October, we competed at St Stithians. All our athletes gave of their best in every race. 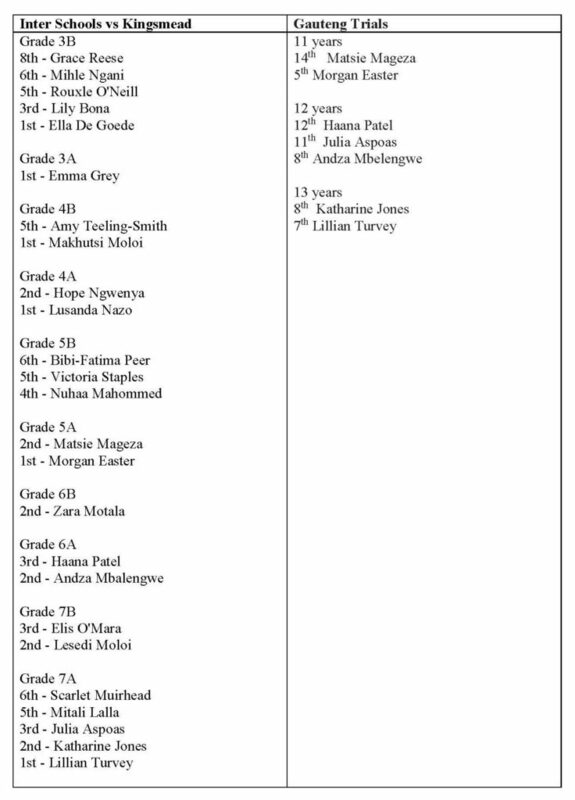 Kingsmead ended in the third position, just 3 points behind St Stithians. Well done to a determined team! Our relays did extremely well! Well done to all the athletes! You did Kingsmead proud! Our next meeting will be at St Andrew’s on Friday 26th October. This will be our last meeting before the Prestige Meeting on the 2nd November 2018. Please keep on attending ALL practices — KEEP ON KEEPING ON!!!!! 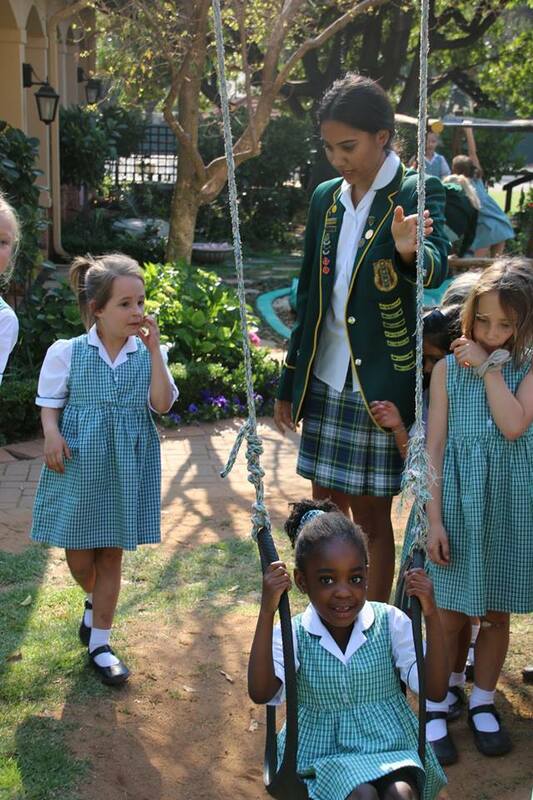 Kingsmead took part in an Interschool’s competition against Roedean on the 11th October 2018 and Gauteng Trials on the 15th October 2018. Below were our results. The C and D tennis teams played against St Katharine’s C and D team on Thursday the 10th of October at the Johannesburg Country Club. It was a beautiful setting for an enjoyable afternoon of exciting tennis where the C team won 57-33 and the D team won 29-16. The C and D team matches are finished for the year but the A and B team matches will continue until the 1st of November. There will be a grade 3 tennis festival on the 1st of November at St Mary’s and we will select a team in due course. 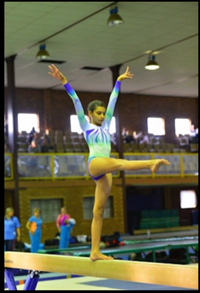 Congratulations to Zahra Khan who was awarded Full Central Gauteng colours for Artistic Gymnastics. Zahra competed this year in the Level 5, 10 year age group. At the Central Gauteng District competition, Zahra placed 2nd on bar and 3rd overall in her age group. She was then selected to compete at the Gauteng Provincial competition, where she placed 1st on bar and 3rd overall in her age group. 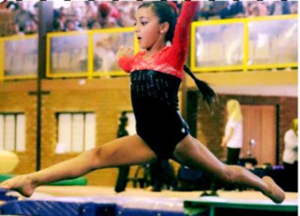 Congratulations also must go to Rumaysa Ismail who has been awarded Full Central Gauteng colours for Artistic Gymnastics . Rumaysa competed this year in the Level 4, 11year age group. After the Central Gauteng District competition, she was then selected to compete at the Gauteng Provincial competition, where she placed 3rd on bar in her age group. Congratulations to Nuru Minyuku Gutto who has been selected to represent South Africa at this year’s Commonwealth games from November 27-December 2. She is now ranked number 7 nationally for kumite. This is a fine achievement indeed and we wish her well in the upcoming competition. 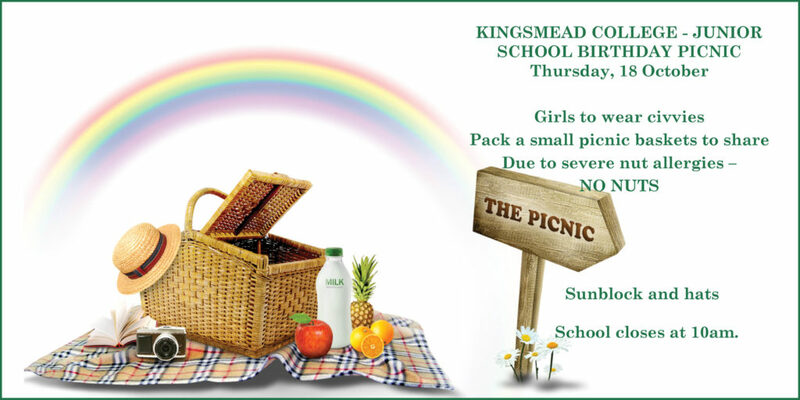 Congratulations to all our budding Kingsmead athletes.